Western blot analysis of extracts from various cell lines using RALY Antibody. 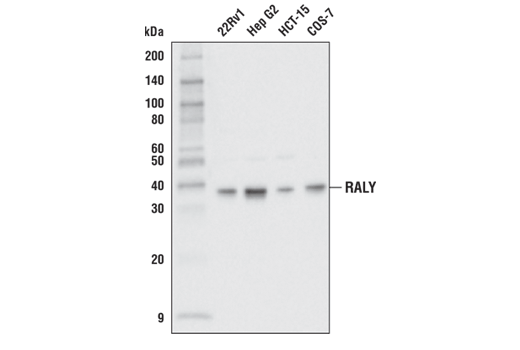 RALY Antibody recognizes endogenous levels of total RALY protein. Polyclonal antibodies are produced by immunizing animals with a synthetic peptide corresponding to residues surrounding Pro163 of human RALY protein. Antibodies are purified by protein A and peptide affinity chromatography. RALY is a member of the large family of heterogeneous nuclear ribonucleoproteins (hnRNPs). RALY was initially discovered in lethal yellow mice, a condition where heterozygotes display an all yellow coat, obesity, diabetes, and tumors. In this condition, mRNA to the 5’ untranslated region of RALY fuses to the agouti transcript (1,2). RALY binds to U-rich elements in coding and non-coding mRNAs undergoing translation (3). RALY has been implicated certain cancer types, as it can control transcriptional regulation and splicing of E2F1 and PRMT1 mRNAs (4,5). Michaud, E.J. et al. (1994) Proc Natl Acad Sci U S A 91, 2562-6. Michaud, E.J. et al. (1993) Genes Dev 7, 1203-13. Rossi, A. et al. (2017) Nucleic Acids Res 45, 6775-6792. Bondy-Chorney, E. et al. (2017) Int J Biochem Cell Biol 91, 124-135. Cornella, N. et al. (2017) J Biol Chem 292, 19674-19692.